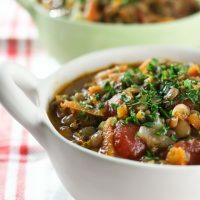 When I was researching the name for this chicken and lentil casserole, I found that people expect different things from a recipe called “casserole”. 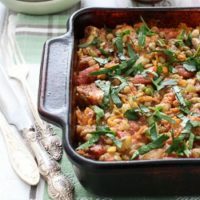 Some people expect a dish that is baked in the oven and covered in cheese; others, think of a casserole as a type of stew; and still, others think of it as a meal that is quickly put together and then slowly cooked in the oven allowing the flavors to naturally develop. 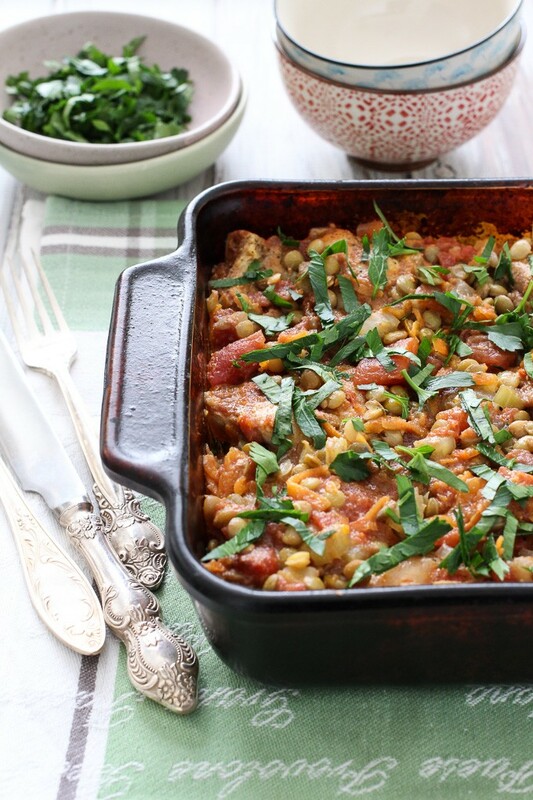 This chicken and green lentil casserole doesn’t include cheese and isn’t a stew. 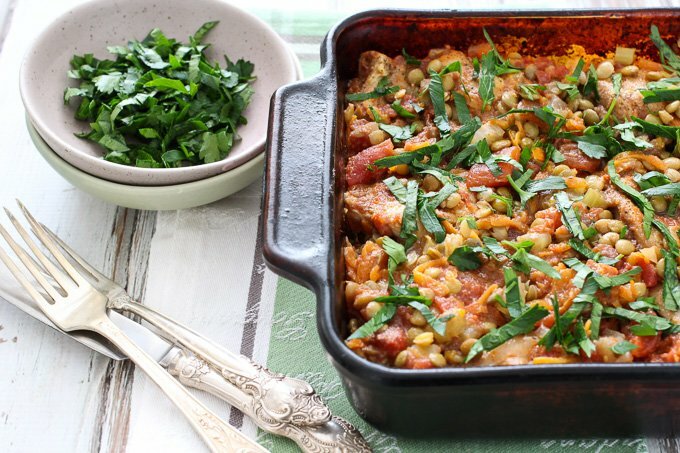 It’s the type of a “casserole” dish that doesn’t take a lot of time and effort to put together. Basically, you just need to quickly saute the veggies, place all the ingredients in a baking dish and let the oven do its magic. In an hour and a bit, you’ll have a comforting, flavorful, and protein-rich dish. 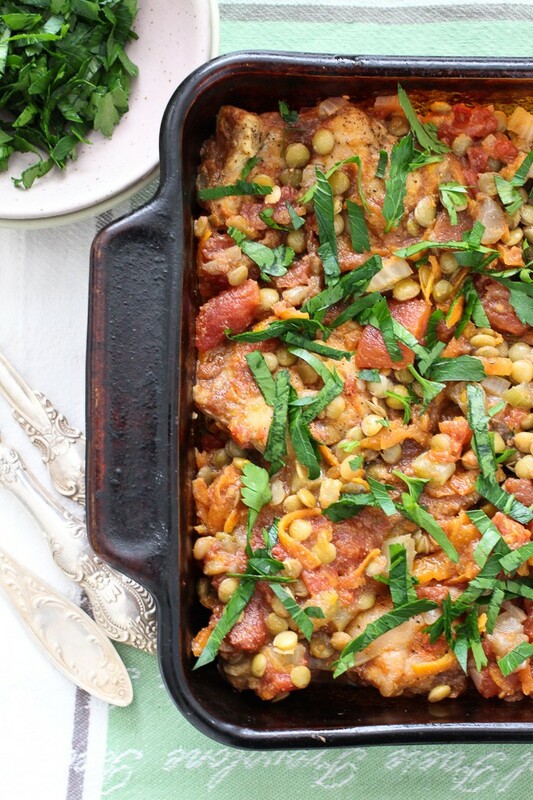 I served this chicken and lentil casserole over buckwheat with a side salad and it was delicious. 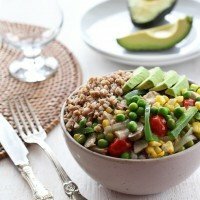 It also tastes awesome over any other healthy low GI grain or with roasted or steamed vegetables. Also, makes for great leftovers the next day. 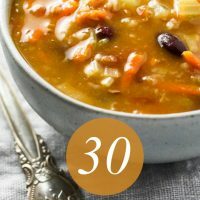 With the winter being almost over (I am being overly optimistic here because we are facing at least another 2 months of winter here in Toronto), I am hoping to start transitioning to lighter, spring recipes. 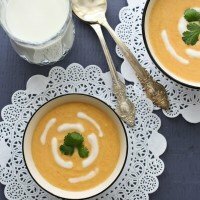 For now, though, hearty soups, stews, and casseroles are doing a great job of keeping us full and happy. 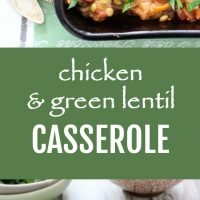 Chicken and Green Lentil Casserole – a comforting, flavorful, and protein-rich dish. Just place all the ingredients into a baking dish and let the oven do its magic. Season the chicken with some garlic powder, salt, and pepper. Set aside to marinate for a few minutes. In a skillet, heat the olive oil over medium heat. Add the onion, carrot, and celery and saute for 2 to 3 minutes until the vegetables start to soften. Make sure not to overcook the vegetables. Transfer the vegetables to a baking dish. Add the diced tomatoes, chicken stock, lentils and 1 teaspoon of garlic powder. Season with salt and pepper and mix to combine. Place the chicken thighs on top of the mixture and press slightly so that they are covered with the liquid. Put the baking dish into the oven and cook for about 1 hour 15 minutes. This was absolutely delicious. I did make some adaptations — I had some baby bella mushrooms, so I added those when sautéing the other vegetables and used 1/2 cup of a nice white bordeaux in lieu of the same amount of chicken stock. My husband loved it too! 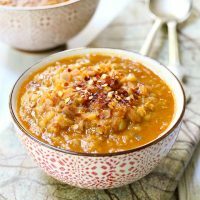 This is a recipe after my own heart, Maria! Great job. Thank you very much, Suzy!! !